For one reason or another the boat trip planned for Sunday was cancelled. Plans were adapted to a picnic at the beach. A rain shower on the drive out had us all wondering if the picnic would be moved to Nana and Grandpa's house. However, as hardy Canadians (cough), we persevered and enjoyed ourselves in spite of cloudy skies, chilly breezes and the occasional spatter of rain. A kite left at the beach provided fun entertainment for Miss A and her father. Can you guess the theme of these three photos? Fathers and daughters. One daughter (and her husband) was missed. And it would have been nice if my own father could have been there, too, but he lives on the mainland. I'm so grateful for the men in my life who respect me, love me, and encourage me - and make me laugh. Little Mister F spent most of the picnic sleeping against his mother. I managed one decent photo, although his eyes are mostly closed. The Little Misses didn't mind the weather at all. 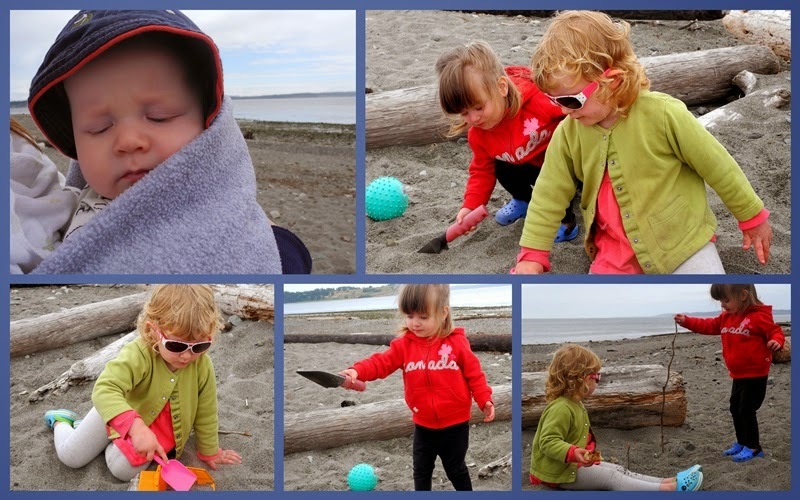 They dug, they poured, they drove, they poked - the beach has infinite play value. All that fresh air had a most soporific effect; we came home and napped, then slept wonderfully last night. I hope the families with little ones enjoyed the same results. Another week begins - what's on your list? Looks like a great day happened anyway!, How great that someone left the kite! Even when the weather is not so good there is still fun to be had! A beautifully written post, Lorrie. I second your sentiment about the men in your life; I feel the same way about mine. 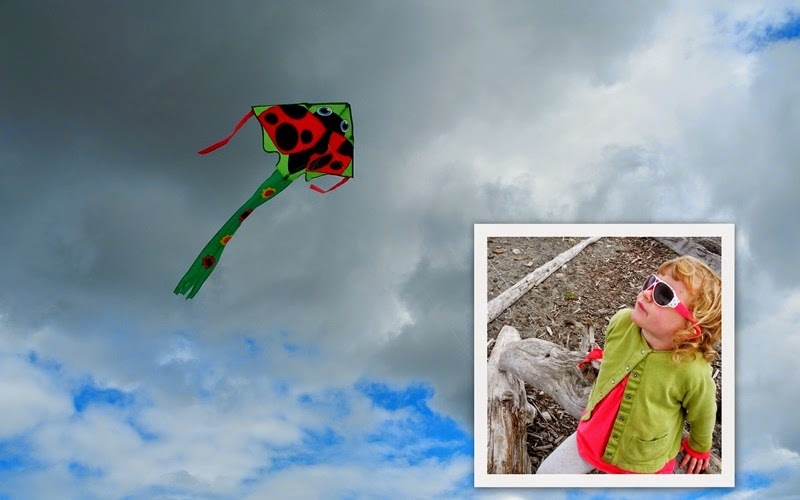 I love that pretty ladybug kite (kites are such fun at the beach), and your grands are just darling. :) Glad you had such a perfect day, my friend. That was a great way to spend Father's Day. The beach, a picnic, play...and a nap! All good! It doesn't appear that a blustery day slowed down your joy at being together. You went with the flow...and it looks like a perfectly good time was enjoyed all around! Looks like a great day even if the plans had to change. Fathers and daughters... a lovely theme. I perceive that your family has mastered the art of celebration in the face of uncooperative weather and changes to plans. That's a wonderful way to live. 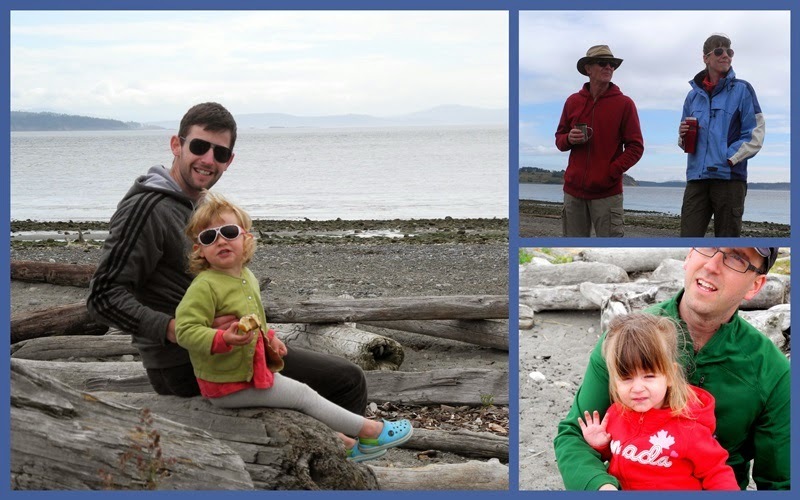 So what's a little rain in the Pacific Northwest when you have a chance to play at the beach? It looks like everyone had a grand time. Love the pictures of fathers and daughters. I think your day at the beach looks like a lot of fun, and time well spent! Any day at the beach is a good day in my books, but any day at the beach with the people you love is a great day!!! PS: Still (happily) entertaining our special guest. ça me rappelle mes filles quand elles étaient petites... des cailloux, des bâtons, du sable et c'était parti pour des heures de jeux. C'est aussi l'idée que je me fais d'une excellente après-midi en famille. Vous avez beaucoup de chance ! Oh, such precious children...and their Dads, too! You captured the perfect day together!